Jugs showcase the best of both breeds. What happens when a Jack Russell terrier falls in love with a pug? Chances are, in a couple of months, there will be a litter of adorable "jug" puppies! Blessed with the lovable traits of both parents, jugs are small dogs equipped with big hearts. While this breed definitely cannot fit into a whiskey jug, jugs tend to be classified as small dogs. Jack Russell terriers measure between 10 and 15 inches at the withers and tend to weigh approximately 14 to18 pounds. 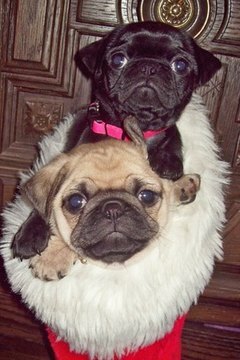 Pugs, on the other paw, measure between 10 and 14 inches at the withers and weigh between 13 and 20 pounds. A jug's size, therefore, will fall somewhere in between these ranges. Since jugs are not purebred dogs, they may showcase some significant genetic variations. 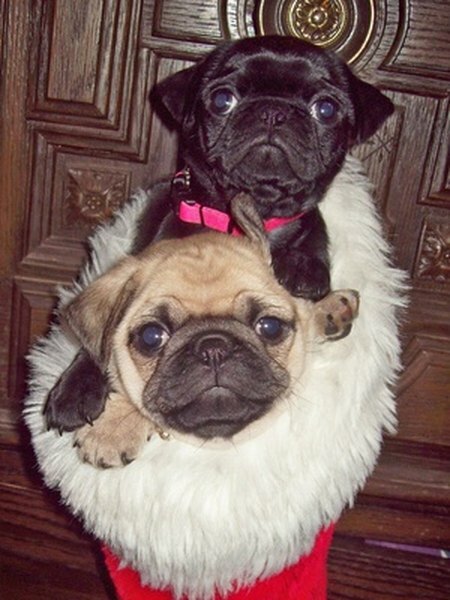 However, in most cases, a jug resembles a pug stuck into the slim body of a Jack Russell. Indeed, the jug's facial features encompass distinctive pug characteristics such as wrinkles, black markings and bulging eyes. The tail may be straight like the Jack Russell terrier's or curly like the pug's. The coat is typically short and smooth, with colors mostly varying from tan to black and other color combinations. The ideal purpose in breeding two different purebred dogs is to get the best of both worlds. However, when dealing with genetic variability, determining exactly what is in store for the new jug owner may be difficult. Generally, jug owners may expect the intelligence and energy of a Jack Russell combined with the charming, loving disposition of the pug. Jug puppies tend to be highly intelligent, a trait that makes training a breeze. A consideration to keep in mind, though, is the fact that both pugs and Jack Russells share a predisposition for "little dog syndrome." Fortunately, with some patience and training, you can wean them off their Napoleon complexes. While the pug bloodlines provide a mitigating, calming effect, jugs can be overall high-energy dogs that benefit from a good training and exercise regimen. Jugs may be susceptible to a variety of health issues, courtesy of some congenital disorders. The short muzzle, inherited from the pug, predisposes the jug to respiratory problems. Other additional problems may be inherited from the Jack Russell terrier including eye disorders, cardiac conditions and orthopedic problems. As much as the cuteness factor inevitably plays a role in the selection of a jug, it is imperative to do research and find a reputable breeder who takes great care in breeding healthy specimens. What Is the Name for a Litter of Newborn Kittens?